A new report from Deloitte highlights one of the downsides of our Aging of the Population theme – the simple fact that economic growth is tied to the number of working-age people in a country’s population. 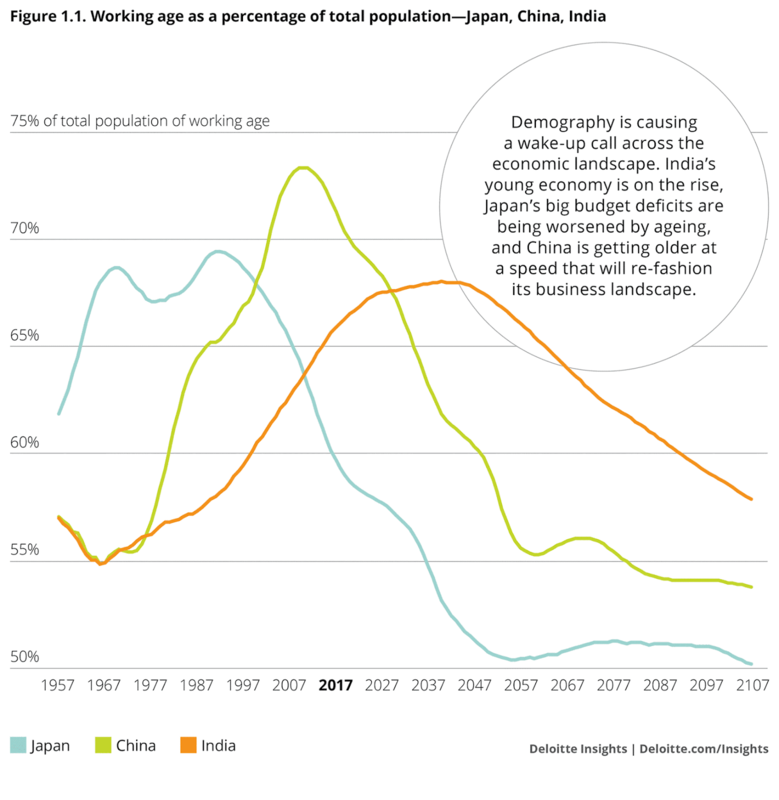 Given prospects for a rising working population, India is widely expected to be the driver of global growth in the coming years while Japan, China, and the U.S. contend with a shrinking working age population. According to Gallup, worldwide 32% of working-age adults are employed full time, and that likely means global growth will be challenged in the coming years as that working-age population shrinks further. A new report by Deloitte Insights, however, says that China will soon be playing second fiddle to India as the biggest driver of global growth.The report, entitled Ageing Tigers, hidden dragons, argues that there is a “third wave” of economic growth in Asia. The first wave was led by Japan in the 1990s before China took over. But the Chinese-led second wave has already peaked, making way for a third wave driven by India. China’s ageing problemImage: DeloitteChina’s ageing population will slow down its growth potential. While its one-child policy is no longer in force, the effects are still being felt. Soon, there will be fewer people of working age. Not only that, but because of the one-child policy, China’s population has aged faster than elsewhere.